One of the “father’s of the Internet” and a distinguished art historian warned in San Diego Tuesday that the promise of widespread digital information is threatened by the danger of losing it as technology evolves. Dr. Vint Cerf, now chief Internet evangelist for Google, said society is in need of what he called “digital vellum” — a technology that can last as long as the sheepskin documents of old. “The digital technologies of the day do not have this longevity,” he warned. Dr. Bruce Cole, an art historian who was the longest serving chairman of the National Endowment for the Humanities, said he became convinced that “in the future, the most important acquisition and dissemination of humanities knowledge would be digital.” But like Cerf, he worries about preserving this information. 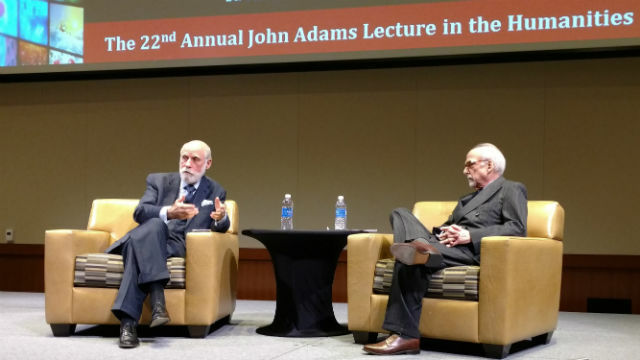 The two men spoke at the 22nd annual John Adams Lecture in the Humanities, named for a longtime chairman of San Diego State University‘s humanities department. Cole, who admitted he used a typewriter long after desktop computers became available, said the worldwide digital library lies ahead. “It’s coming, and you’ll be able to hold it in the palm of your hand,” he told an audience of several hundred faculty and students. “Should a university board of trustees, in 2016, authorize a large edifice costing millions of dollars to hold printed books and periodicals?” he asked. He said that from his perspective “digitization is preservation” because it can protect physical objects like newspapers that will disintegrate over time. “Obviously I see a bright future for the humanities in the digital age,” he said. He noted that efforts are underway at the Computer History Museum in Silicon Valley, by Internet entrepreneur Brewster Kahle’s Internet Archive, and at Google to preserve software, websites and books for future generations.